Monday Madness — Vote for the Official Lent Madness Hymn! The epic first pre-season episode of Monday Madness has arrived! Epic? Yes! Because Lent Madness 2019 marks the Saintly Smackdown’s TENTH year. To properly prepare, you’ll want to load up on tenth anniversary collectibles and start scoping out locations for Lent Madness launch parties. Ash Thursday (March 7) venues will soon be booked solid with Lent Madness Tenth Year Launch Parties. This week, Tim and Scott talk about how it’s never too soon to start preparing for Lent Madness. 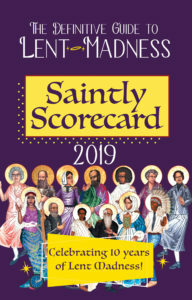 It would be a good idea to buy your 2019 Saintly Scorecard now, before they sell out. Just like last year, we are selling the scorecards individually or in packs of 10. To get the best price order three or more packs of 10, for an unbelievably low price of just $1 per scorecard. You’ll also want to buy giant 2019 Giant Bracket Posters. They’re a steal at just $11. There’s no extra charge for the full color printing. But the main reason to get excited is your chance to help select the OFFICIAL HYMN OF LENT MADNESS. That’s right, we’re finally establishing the official hymn of Lent Madness. Once it’s chosen, it would be appropriate to insist your choir sing it on every Sunday in Lent. It should also be sung every time a member of the Supreme Executive Committee enters a room. Think Hail to the Chief, but in a penitential, Lent-y sort of way. We are very grateful to Sr. Diana of the Community of the Transfiguration for writing these hymns. And with this post, we are naming her the official Hymn-Writer in Residence for Lent Madness. Her work will also accompany us throughout the competition, as she’s in the process of writing a hymn dedicated to each one of the 32 saints in the 2019 bracket. Seriously. (rumor has it she’s already halfway through the lineup). So here’s the deal. We’ll print the words of the hymns below. At the bottom of the post, you can vote (once only, please) for your favorite. We’ll cut off the voting at noon next Monday, February 4. The winner will be announced on next week’s episode of Monday Madness. If you want to help out, we’d love to get recordings of these hymns. If your church choir can record them — send us a link to your video or audio recording and we’ll share your recordings on social media or here on the Lent Madness website. Doesn’t your choir want to be famous? A Grammy is practically inevitable. Anyway, here are the hymns, with tunes suggested from the official hymnal of the Episcopal Church. Choose wisely, and Happy Lent! Which ones we’ll see again. Which Saint, each day, we’ll approve. We stretch our hearts and minds. They give us the blues! Oft is not in others’ views. Of Saints; you must agree. To keep Saints in line. Relieved that we’re not one, too. Who ought to win the nimbus (gold!). “They’re all great!” is our plaint. And whose loss we’d sadly rue. *It was necessary to put these names in alphabetical order lest the Archnemeses think favoritism is being shown. Such favoritism would be folly in the extreme, since to get between them when they are archnemesising is dangerous to the soul, if not to the sanity. **except all but the first Saturday and all Sundays in Lent (Sundays, we know, are not part of the observance of Lent). ***Supreme Executive Committee – soi-disant, of course. ****In order to be fair, The soi disant Humble Hymnody Committee of One reversed the order of names this time. Stressing o’er which Saint to choose. Who to vote for, who refuse? Made it so hard to decide. Saint v. Saint’s our Lenten Trial. For each Saint we offer praise. Enrich our hearts and stretch our minds. Who daily give us laughs and fun. They bravely, true and faithful served. With them through Lent we march, unswerved. Is choosing who should get more praise. Is penitence naught can remove. Still through the darkness gleams the light. Fast comes the day of halo bright. The winner’s blessing’s our release. OK, Lent Madness public: vote for your favorite hymn. Don’t be too confused by the fact that there are — for the first time ever, in Lent Madness history — three options. You still vote one time only for your favored choice. May the best hymn win! What's your choice for the Official Hymn of Lent Madness? 64 Comments to "Monday Madness — Vote for the Official Lent Madness Hymn!" Who’d have thought I’d look forward to Lent?! I am pleasantly surprised to see I’m not the only one who likes choice 3. For one thing, I think the hymn itself is often overlooked (“It’s gloomy!” “Well, yeah; it’s Lent.”) and for another, the lyrics and tune seem to fit together better than the other two. Choice three in the presentation of lyrics; choice two in the voting list. I stand with all Verdery’s reasons for opting for Forty Days and Forty Nights. Just try singing the first two and you’ll see. Sunday in Lent will be hard enough…#3 is my choice! Dear Sirs or Fathers, none of the listed hymns blows my cassock up nor am I tempted to toss my Biretta in the air. I humbly submit “You Can’t Always Get What You Want” by The Rolling Stones. This hymn will bring tears to a glass eye when played on magnicent pipe organ. I’m confident that after prayerful consideration and fasting you will see the wisdom in my suggestion. I agree, even though I voted for #1.
hmmm. I voted for #3, but …the Rev. Canon does have a point. Plus I AM a Rolling Stones fan. too late, (sigh) as I’ve already voted. Love it! Keep your skirts under control. Holy Hymnody! I agree with your wisdom, Rev. Canon John Day. However, I submit “Purple Rain” by Prince. It has a very nice whine suitable for Lent. “Pious Dudes” is much cheerier — perhaps less Lenten, but more fun! And perhaps we need fun — isn’t that the point of Lent Madness? I agree. We need a little fun during Lent! I, of course, had to vote for “The glory of these forty days” (Tune: Erhalt uns, Herr) because it is the only tune of the 3 that is in “Evangelical Lutheran Worship” or any of the other Lutheran Hymnals I own of various vintages–and then after all Martin Luther did write the words for which this tune is originally meant for. Yes, I knew this should be the winner! For all the saints who from their labors rest? Yay Betsy. I voted for number 2 but I like your suggestion better. Two pious dudes is my vote cuz I want to be one too! That’s the one I was looking for too Betsy! I think we need another hymn bracket. Yes, I would have loved to have seen Sr. Diana’s take on 287. Lots of possibilities there for her talents! But of these I’m with the two pious dudes in the spirit of Lenten levity and a more upbeat tune for our daily high and holy hymning. Happy Anniversary, dudes! I live in Alberta Canada and just saw the video where you said you live in Higham Massachusetts. Well my relatives, the Andrews family take up a great deal of space in cemeteries in Higham dating all the way back to Thomas Andrews in 1643! Come back and visit! The Hingham Cemetery is one of my favorite places in town and it’s right around the corner from my parish. #3. Because singing “Who daily give us laughs and fun” to the tune Erhalt uns, Herr is not to be missed! Lent is coming – can’t wait! Sin is everywhere! Many loyal followers of Lent Madness are not of the Chosen Frozen. Some of us may have hymnals and can check the melody, but it would be kind to also indicate the most common version of the melody. Yes, more help with the tunes would be helpful. I recognized #1 right away, but having neither German nor hymnal, I have been wandering in the wilderness of the internet. I did find #3 and a half hour version of #2 on Utube. I’m not sure where to plug in the words on #2. I voted for #3. Many thanks to our sainted lyricist. I found all the tunes very easily with a Google search — both in printed musical notation and on u-tube. Thanks for thinking up something new to celebrate the anniversary. Onward and upward ! Yes Lent is serious so I chose the first hymn to bring some Lenten Levity. I’m voting for the first one, because the lyrics have clever twists on the lyrics of the source hymn, which I can never sing with a straight face. Who can’t smile at the echo of “And I mean to be one, too” in “Relieved that we’re not one, too”? “They bravely, true and faithful served. All three hymns are great, but this line in number 3 is so spot on for Lent Madness that it gets my vote for The Lent Madness Hymn. Sr. Diana has had a wicked sense of humor even when we were graduate students in Iowa City 35 years ago!! I love these, and love that she continues to bless us all with laughter! Number one is a popular, uplifting melody that creates a positive spirit. people may want to hear it again to see how the new words fit in, Two and three are rather dull and should be slain by a fierce wild beast! Chances are, however, they would then pick up their heads, tuck their entrails back in, and march on! Is penitence naught can remove.” in verse 3 of ‘glory of these 40 days’ uniquely add a valuable sentiment to the season. And with three hymns to choose from, the majority of us voting will likely be Losers, and have to work with this sentiment very soon. Next year, a hymn bracket, please. This was just a taste of the life to come in our Lenten observations. “Two Dudes” is the obvious choice. I voted for the hymn that cracked me up so much I could hardly sing it. “Lent MADNESS,” y’all! Thank you for leaving out “I sing a song of the Saints of God!” Sr. Diana has outdone herself! Superb idea!! Why limit Lenten selections to the hymnal?? I agree with Simon Hartropp. The lines “Acceptance when our choice doth lose/Is penitence naught can remove” won my vote. I STILL can’t believe Martin Luther didn’t win the 2017 Golden Halo. How can it not be “I Sing a Song of the Saints of God”??? Otherwise known as The Flintstones Hymn. “Who to vote for, who refuse.” to “Whom to vote for, Whom refuse.” to be grammatically correct. So glad to get the alert. I have been looking forward to Lent Madness since Jan. 1. When I saw the title in the email – 2 songs came to mind – Purple Haze by Jimi Hendrix and 40 Days 40 Nights by Muddy Waters. I would love to see Sr. Diana work some wonderful lyrics for those for next year possibly. Thanks for the creativity in this year’s choices! One thought, can members of other faith traditions be considered, if they exhibit the best of Christian ideals of service and sacrifice, just a thought. Love choice #1 as it is light and funny during a serious time of year. We need a bit of seriousness but also some amusement to get through this. I agree with others that it would have been much easier if each hymn came with a link to the appropriate music on You Tube. I couldn’t get the words to #3 to work out with the music but maybe I didn’t have the correct music on You Tube. #1 was the only one that I knew the music for and it’s one of my favorite hymns. So for that reason and because the SEC has given me a fun and inspirational lenten devotion I voted for #1. Although I am moved by the line about accepting defeat of our favorite (I’m still sad Peter didn’t win last year). Thanks Sr Diana! I’m all in for #2. I like how you’re going all out for celebrating year #10. I have another celebratory idea! Here’s an epiphany and variation on the theme of Lent music: would you consider asking Maestro Shiloh to write his Lent Madness theme improvisation as a musical score? Think of the possibilities for its sale in the Lentorium — the perfect gift for a favorite parish musician. Would he make a deal with you? Would you make a deal with him? Great idea! It would also make a great ringtone. For those who do not know the tunes, here are links for you. There are many others out there, but perhaps these will help. Wow, this is a tough start to Lent Madness. I’m glad I have a couple of days to think it out. Yes! I’m almost never with the leader when I vote! I voted for number one. I’ve always liked the tune/hymn, and I agree with those who have said that we need a little fun during Lent. Looking forward to the madness!! « Happy All Brackets’ Day!